Noah’s initial encounter with R2D2 happened a couple of weeks ago, when he has yet to be introduced to Star Wars story line. I set off to correct that right away. So far Noah has watched the first two episodes from the original trilogy–“Star Wars” and “The Empire Strikes Back”. R2D2 becomes his favorite character. He knew who Luke is. He was mesmerized by the ending sequence when Luke and his comrades piloting fighter jet to destroy death star. 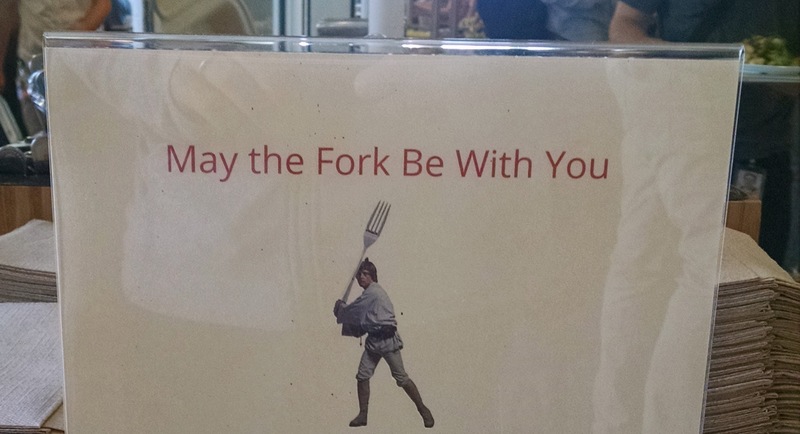 He laughed when Yoda appeared for the first time, and quickly commented that “he was hungry” when Yoda sneaked a bite off Luke’s food. He knew Luke got the saber from “the good old man 好人爷爷” (obi one kenobi). He was very troubled when i first tried to explain the revelation that Darth Vador (“The bad guy 坏人”) is Luke(“The good boy 好人小哥哥”)’s dad. Last night after dinner. We sat together on the sofa and flipped through a few issues of recent “The New Yorker” magazine together. Noah liked its cartoon cover and the cartoons inside. 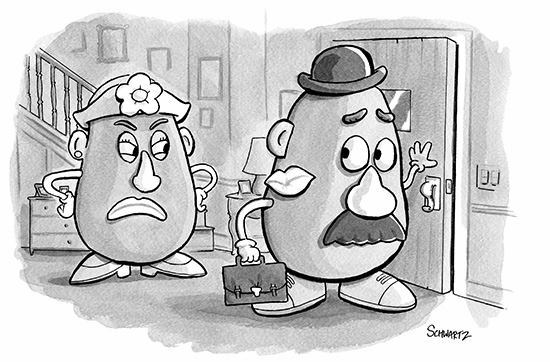 He especially liked a recent cartoon depicting Mrs and Mr Potato Head, whom he had known from Toy Story trilogy and his own toys. Then i flipped past a photograph of someone wearing a long black robe standing in the dark. Noah said, “May the force be with you.” I couldn’t believe my ears and doubled back, “what did you say? say it again.” He repeated it, “May the force be with you!” I was astonished! ZM didn’t understand what it meant (he never watched Star Wars before i showed it to Noah recently), so i had to explain to him. Noah listened with a knowing smile on his face. This entry was posted in Family, News & Media, Random Thoughts by Jean. Bookmark the permalink.